About Us — Painted Curtain Pole Co.
1. Our family run business revels in exceptional customer service, with a brilliant team of artists helping to guide you before, during and after your purchases. 2. Our finials are all handcrafted in our workshop with attention to fine detail. 3. Painting multiple layers by hand, gives the necessary density of paint and varnish to provide an outstanding quality and longevity, which cannot be achieved by spray painting. 4. Your unique window dressing is available in any paint manufacturing colour to complement your interior scheme. 5. All is painted to order and will be with you within 3 weeks. A fast track service is available upon request. 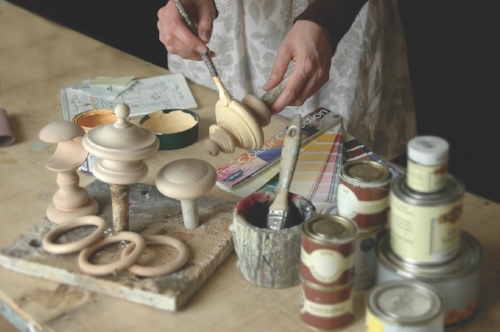 Our curtain poles and finials are in endorsed by Vanessa Arbuthnott Fabrics. Please visit their website for more inspiration. Please contact us regarding any window dressing. We thrive from problem solving, designing and making your window beautiful. We guarantee you that our unique process protects and finishes the pole so the rings glide beautifully for years. We produce an outstanding, high quality product which is all beautifully hand painted. We have competitive prices, a unique product and a personal touch. We can guarantee a pleasurable purchasing experience. Sally - I have a passion for arts, travel, the outdoors and my beautiful home. My favourite place I have been to is definitely Morocco! I spend my weekends exploring the local countryside with my Springer Gypsy, visiting family and relaxing in a Yoga class or at the theatre. I have two amazing children, one who is my work partner/adventurer Holly and the other is James who is a chartered Accountant in the city, I couldn't be prouder. Holly - I do love my art and design, I.T and Marketing during the week, however during the weekend I become a bit of an adrenaline junkie! My relaxing would be getting out on my mountain bike, white water kayaking, surfing, windsurfing and climbing. I adventure with my partner and our dog Monty! spending a lot of our time exploring locally or venturing to Wales, Devon, Scotland and the Lake District.